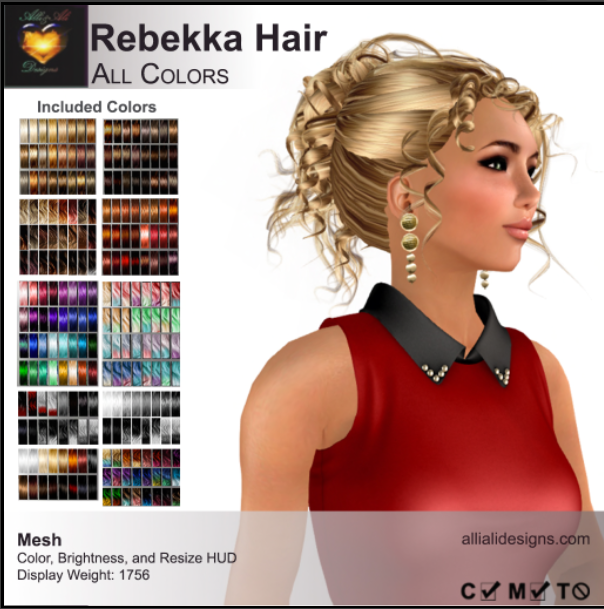 Today’s review is of Alli&Ali’s new Rebekka All Colors collection of designs and colors. This is an elegant style, perfect for those nights on the town with your significant other, BFF, or any other dress-up occasion. And as you can see, it comes in just about any color imaginable. Naturally, I’m going with red. I’m also back to the grey curtain background, but I’m working on something better. After all, a girl just isn’t a girl with a stovepipe coming out of her head! Much like Alli&Ali’s Love Hair, this is a large purchase, and it costs $1500L. 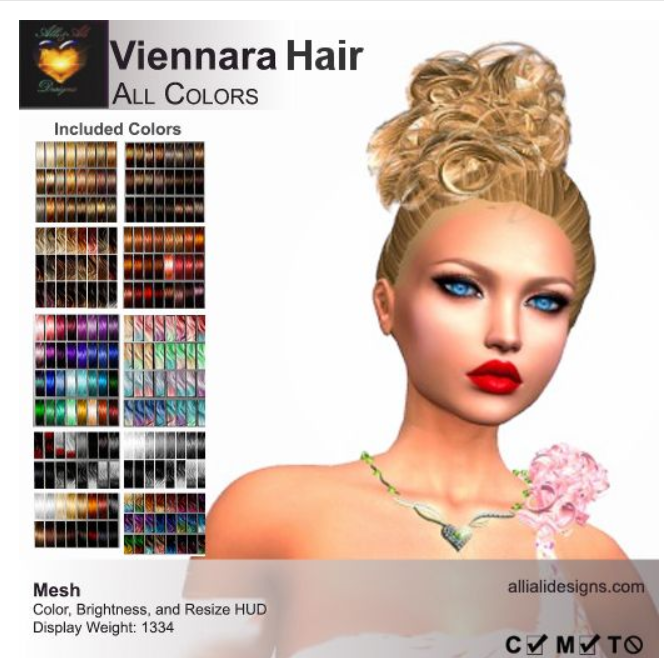 But given the variety of colors, it may well be the last formal hair style you’ll need. Find it at Alli&Ali’s Mainstore, in the Updo area. Now what did I do with that invitation to the ball? My latest style discovery from Alli&Ali is Katniss. 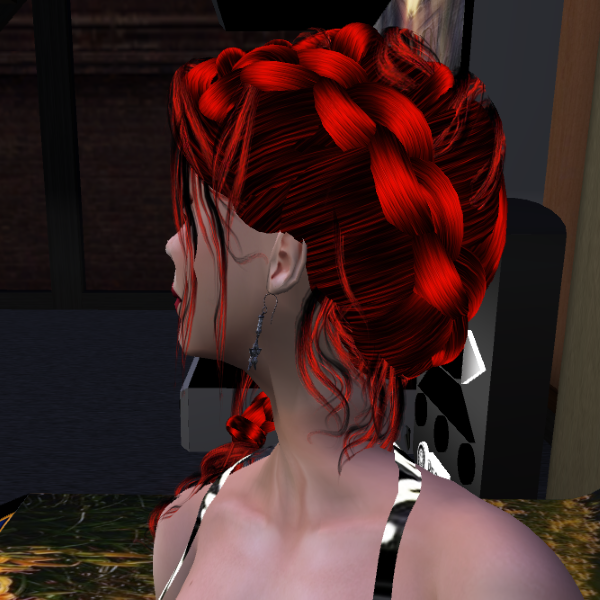 It’s another braided style, but it’s a little more formal than Jodie. I like to wear it when I’m dressed for an evening on the town with my beau. Katniss is available in all of the colors shown, and each color has its own HUD so you can select the exact shade you want! The set sells for $250L, which as of this writing, is about USD $1.00—a very reasonable price for the set. Finding the exact skin shade to match your Maitreya Lara avatar. Their prices are extremely reasonable. In fact, you can find a lot of them on the Second Life Marketplace for $1L (one Linden). 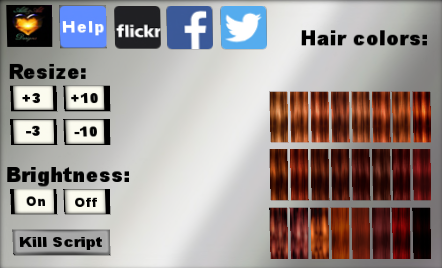 Once you’ve resized the hair (if necessary) and selected your color, you can delete the scripts. WARNING: as with all styles from Alli&Ali, be sure to make a backup copy before customizing your hair! This is not included for all styles, because most can be resized to fit your head exactly. It helps to cover head parts poking through the hair. This may be useful if you use a rigged mesh hair. If there is no alpha included and you still want one, come visit the mainstore and get one from the box on the info desk. DISCLAIMER: As an approved Alli&Ali blogger, I received the entire Jodie range of colors to review for this blog.